"Verily, this matter (Islam) will reach where day and night have reached, and it will not leave a house of Madar (mud or clay) or a house of Wabar (fur of camels and goats, i.e. tents) except Allah will bring it into this Deen, (either) with the honour of an honoured one, or the disgrace of a disgraced one; honour with which Allah honours Islam, and disgrace with which Allah disgraces Kufr (disbelief)." It is obvious that you are passionate about Dawah , if you intentionally came to this website. If however your visit was unintentional, we consider you indeed a fortunate human being. May Allah reward you with Jannat-ul-firdaus. It is our great pleasure to welcome you Islamically to IMADAWAH (Learning & Dawah) experience in which all the gates of the divinely revealed knowledge & guidance are shown to you but the keys reside at your finger- tips. It is a cross platform , internet & (IMA+) devices based application with awesome user interface which makes instant messaging of videos, images, audios, v-cards & texts extremely easy via mobile devices. IMADAWAH denotes an integrated, web based Dawah solution portal; which broadcasts via (IMA+) applications to (IMA+) compatible mobile devices. It is a free, non - profit making Dawah network that markets the authentic message of Islam. It is overseen & supervised by competent global scholars & daees (callers) and facilitated by volunteers around the globe. It however connotes SIMPLE, PERSONAL & REAL TIME DAWAH MESSAGING. WHAT IS UNIQUE ABOUT IMADAWAH? Internet (web based) Dawah began with great promises to change the way we live our lives & it was pretty great. While the internet (web based) Dawah is capped up with ever changing needs, the way we experience it has not changed until the arrival of IMADAWAH......A true game changer, absolutely amazing achievement, a seismic shift from & for the web , a trail blazer, thinking & acting globally, Dawah Without Borders, a union between innovation, technology & Dawah. At IMADAWAH, we are fully re- engineered & automated to unlock what is next & to serve you better; with volunteers manning servers around the globe waiting to grant your Dawah requests & provide answers to your questions. To deliver the divine & pristine (authentic) message of Islam to all & sundry via the (IMA+) Handle. Islamic Education & Islamization of knowledge. To bring every human being back to absolute submission to Allah (s.w.t), In sha Allah. Regular broadcasts of authentic Dawah messages (text ,video, audio, images) via IMA+ handle to Muslims. Regular broadcasts of messages (text ,video, audio, images) appropriate for non-Muslim audience via IMA+ handle. We EDUCATE, INFORM,CLARIFY,EMPOWER,INVITE & INSPIRE through broadcasts, answering questions, giving guidance ,advice etc. about Islam, salvation & issues related to Islam for all. Abd-Allaah Ibn 'Amr (ra) said the Prophet (saw) said "convey from me, even if it is one verse." (Bukhaari). MOTIVATION : WHAT MAKES OUR HEART MELT? When you hear a beep on your phone or any IMA+ handle compatible device, you are sure we are definitely going to remind you about Allah (our creator) & His Messenger (peace & blessings of Allah be upon him) & we will be with you till we all end up in Jannah (Paradise) In sha Allah. When we lose count of the rewards we will both get as we provide the Dawah messages and you share the messages & the endless chain of re- broadcasting which will continue till the day of Judgment In sha Allah. The thought of billions of people that have benefited & will benefit from the messages In sha Allah (through improved knowledge & practice of pure Islam). When you pray for us, advise us & feed us back. Recipients of IMADAWAH messages across the globe are asking & wondering how to help IMADAWAH grow from strength to strength. Just like you may be thinking or asking yourself right now. Reading, watching, listening to & digesting the Dawah messages sent to you to improve your knowledge & practice of Islam. By sharing it with all your contacts (go to whatsapp setting on your device to create a broadcast for all or some of your contacts) so you can share with them easily & at once. By adding our whatsapp contact to any group on whatsapp & sharing the messages with any whatsapp group that you belong to. 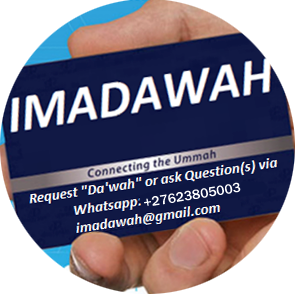 By publicizing & advertising IMADAWAH through digital marketing, print & electronic media, souvenirs etc. to the best of your ability. By contacting us for further discussion if you are willing to support us through any other means. By watching & sharing our promotional video at this link. https://www.youtube.com/channel/UCQX05tBiFeUPpYL_ZS5UPXw and helping us to make another promotional video. The sacred knowledge is at your finger- tips, knowledge that will illuminate our lives and the lives of our friends & loved ones. So, fulfill the prophetic command which makes seeking knowledge obligatory on every Muslim NOW! May Allah forgive us all our shortcomings & may He show us His face on the day of Resurrection (Ameen). TRUTH is defined as a fact that has been verified or is in conformity with reality or actuality. We sincerely & genuinely appreciate your courage & determination to seek clarifications in your quest for salvation. Indeed, we consider you to be a real ambassador of truth willing to seek the complete truth at all costs. Bits & pieces of truth are many but the complete truth is one. God willing, we promise not just to provide you with the truth but the complete truth in all our conversations. We have also committed ourselves to treating you with courtesy & respect. We implore you to kindly reciprocate this gesture by expressing the whole truth & adhering to the principle of mutual respect. We implore both parties to keep an open & objective mind for maximum benefit. We like to remind you that there is no compulsion whatsoever in this exchange of ideas about the whole truth of salvation. We are looking forward to a mutually beneficial, fruitful, objective, open minded interaction that can lead both parties to the ultimate pleasure of God (salvation in the hereafter). Oh truth seeker, we welcome you once again to IMADAWAH: sharing the complete truth. This project intends to provide all our clients around the world with long audio lectures of any scholar, or (daee) of their choice around the world. Simply request via whatsapp, by telling us the the name of the daae(s) or scholar (s) & the titles (s) of lecture(s). We will send it to you via whatsapp In sha Allah. THE SUNNAH , THE BETTER. This is a comprehensively designed constellation of materials (audios, videos, pictures, text) to promote the sunnah in all ramifications e.g. etiquettes, supplications, smile it's sunnah etc .This is part of the routine broadcast. It does not need to be requested.